“Squatting” isn’t hurting your knees…. YOUR technique is!! Question: The issue of squats and knee pain has come up twice for us in clinic this week – one guy who has some meniscal irritation (I think – negative MRI but positive medial joint line tenderness, Thessaly and McMurray) and one guy with what I”m guessing is patellofemoral tracking problem b/c no tests are positive at all but I reproduced his pain by palpating the underside of his medial patella. Anyway, I remember hearing a sport doc saying that most people go down too low when they do squats and that there’s no need to actually go that low to train the muscle. And I’ve also heard that the Smith machine puts people in a bad position for their backs for squats. It seems like there are lots of ideas out there about squats but I”m not sure if there’s any “best” or “safest” way to do them. Maybe people with knee pain should find a different exercise to strengthen their quads? Answer: From observations, I would say that 1% of people in any particular gym actually have the flexibility, coordination, balance, and most importantly KNOWLEDGE to actually perform a proper squat exercise. For these few, the full squat is considered the preferred lower body exercise for safety as well as athletic strength. The squat, when performed correctly, is probably one of the safest exercise for the knees and the best to build knee stability (as well as many, many other befits). The problem of course is when one of the 99% of the ‘others’ attempts to perform it and end up in your clinic. This is not a fault of the exercise…rather a fault of the individuals technique. Regarding the knees….. A full squat is where the hips drop below level with the top of the patella. Any squat that is not deep, the ‘partial’ squats, stress the knee and the quads without stressing the glutes, the adductors, and the hamstrings. The hamstrings and adductors, when under the tension required for proper form exert a posterior tension on the tibia by way of their distal attachments, and the net effect of the anterior quadriceps tendon insertion is an anterior force against the tibial plateau. With sufficient depth (and with the correct form as described in the video – where hamstring/adductor tension is maintained during the lift), anterior and posterior forces on the knee are balanced. Thus the total shear force on the knee is nil. In partial squats, the anterior shear is allowed to occur without being ‘checked’ by the posterior pull of the hamstrings. It is the shearing forces that cause most of the problems that put the blame on “squats.” As described in the video below, when the knees translate forward, the distal hamstring insertion approximates the proximal insertion thus reducing total tension of the hamstrings and adductors (mainly magnus). The strength coach below is the famed Mark Rippetoe. Author of Starting Strength, a book the I highly recommend if you would like to learn more about the basic barbell lifts (squats, dead lifts, cleans, bench, standing press). 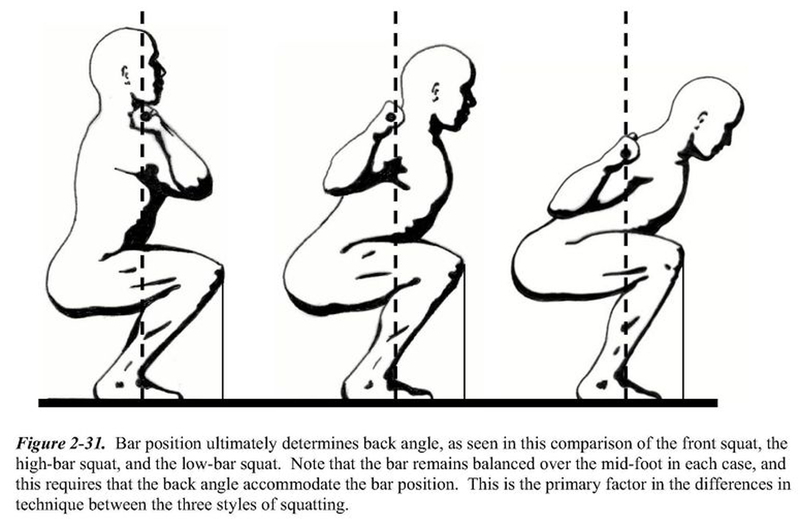 In the video below he discusses some of the important aspects of a properly performed squat (although there is much more information that is necessary in order to properly learn the lift). The second video is a clip of him coaching the lift. why are the glutes left out above the Patella line? Does that mean the wall sit isn’t reaching the glutes? And Ball Squats are only training the Quadriceps? They are presceibed to so many knee patients, who woud then not train the medial hamstrings for knee stability, if you were right. I thought, that in the squat there was no lengthening or shortening of the muscles of the front and back thigh, since origin and insertion are moving together. If the knee translates forward and the hip flexes more, the length would still be there. Only if the hip extends more, the hams would be shortened (and experience passive insufficiency?). So isn’t it more the question of the lower leg and back being parallel? If I understand everything above, you are to be added to the fraction ” knees not over toes”? The fact that lengthening and shortening of the muscles themselves remain constant does not account for the connective tissue/fascial components which are very important in this equation. By sitting back, bending at the hip (such that the back and legs are parallel as you mentioned) is also very important in order to create posterior line tension. This tension will act to strengthen the line…both muscular components as well as fascial (remember, when we train, we are not only training muscles), as well develop a posterior pull on the tibia to prevent shearing of the femur-tibia articulation. Regarding the fact that may people are prescribing it the other way….people also believed that you could preferentially activate the “VMO” during squats for PFPS patients which we now know to be false. People who were prescribed these exercises in may situations probably got better…however that is not the concern….the concern is what is the best, and fastest way to get people better. I’ve been squatting consistently for 6 months and have made great gains in strength. However; I am now experiencing knee pain on the medial side of my knee cap and slightly above where the VMO insertion is. Ortho diagnosed it as a grade 1 VMO strain but it feels more like a tendon or tracking issue. Also the quad tendon on the very top edge of the patella is very swollen and tender. Thinking back, I realized that my quads get very sore from squatting but my hamstrings and glutes rarely get sore. My question is this though. When I walk, my right foot naturally rotates outward and my ankle pronates slightly. This gives my right knee an exaggerated Q angle (knee slightly collapses inward/medially). Since I’ve been this way all of my life, should I rotate my right foot outward further than the left foot (example: L foot 30 degress, R foot 45) to help keep the knee from going into a valgus position? I try to consciously sit back and down into my squats and drive the knees outward but my foot angle has typically been straight or slightly toes out (10 degrees). Unfortunately for a case like this I cannot provide any advice without first having assessed you. I will say that I rarely, it ever recommend that someone consciously change their gait or movement patterns as this will likely throw off something else in the chain.